Metaphorically speaking, West Linn resident Debbie Ethell has successfully picked herself up from the mud. At one point in her 20s, Ethell was homeless, an alcoholic and had a single set of clothes to her name. Now 20 years sober and the founder of the KOTA Foundation for Elephants, a nonprofit organization dedicated to educating people about African elephants and threats to the species, she glows with pride when considering how far she's come. 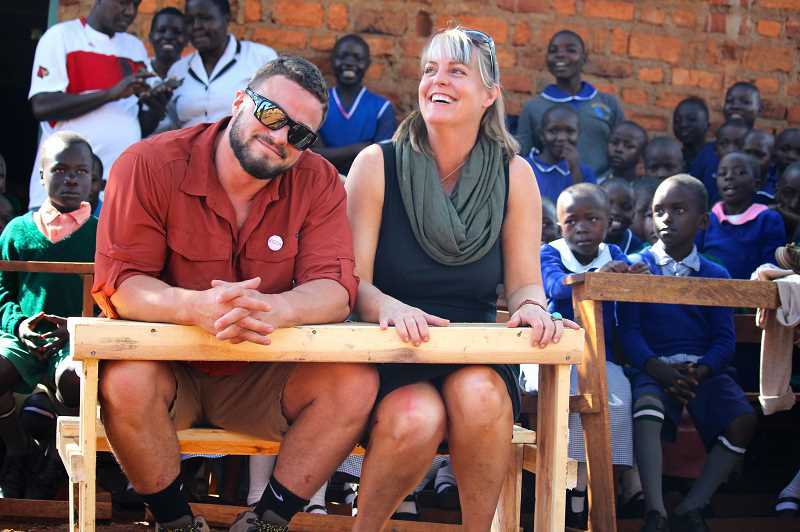 But while visiting Kakamega, Kenya, to tell local students about the lovable large mammals, she realized that before they could learn, the students needed a place to sit — other than in mud. In many Kenyan classroom, students have no desk. 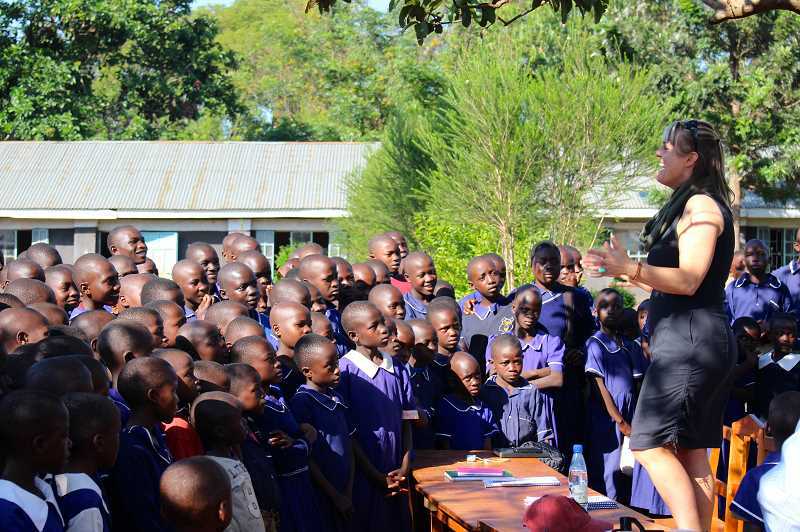 With the help of the Rotary Club of Wilsonville, Ethell will present six schools in Kakamega with hundreds of desks, as well as some school supplies. Wilsonville's Rotary Club contributed $5,000 for the initiative and is considering further donating to the region in the future. "We were completely overjoyed. That was incredibly generous," Ethell said of the Rotary's donation. "This is a very unique project." Achieving sobriety wasn't the end of Ethell's troubles. Right before the Great Recession, her spray tanning business was shut down due to a law change, and she subsequently lost her home. Unable to find work, she took a career discovery class at Clackamas Community College. There, the teacher gave Ethell a seemingly easy task — think back to what you wanted to be when you were 8 years old. After more than a day of contemplation, she wrote down one word — Eleanor — and burst into tears. Eleanor was a subject in a "60 Minutes" episode about elephants that was aired during her childhood, which sparked Ethell's obsession with the mammals that lasted well into her teens and inspired her to document histories of individual elephants using public databases. "When I was 8, anytime there was anything hard going on in my life, I would pull out an elephant book," Ethell says. "That was the place where I lost myself." After realizing her calling (and her sobriety) Ethell took a fifth-grade level math class, ending with calculus and graduating at the top of her class with a degree in general science from Portland State University. Then she created the nonprofit. Through the nonprofit, Ethell teaches lessons at local schools in Africa and delivers speeches at Rotary clubs and businesses to raise awareness about African elephants, which are considered vulnerable by the International Union of Conservation and Nature. Along with teaching audiences about detrimental practices such as poaching, the ivory trade, land development in elephant migration routes, and how the decline in African elephants affects local habitats, Ethell discusses lighter topics like how elephants can communicate with one another from 20 miles away by sending infrasound through the ground and how a mother elephant never separates from her children under her own volition. "I was impressed by how many people were fascinated by them, but how little they knew about them," Ethell says. "I think on some level, I don't think it's on a conscious level, there's something about elephants that reminds us of us. I do think it's this strange subconscious connection that we have." Ethell first visited Kenya in 2014, where she helped document what had happened to elephants set free by workers in the David Sheldrick Wildlife Trust. She has made a few more trips to Kenya since and was asked to teach students in Kakamega a couple years ago. In one of her talks, Ethell asked hundreds of students if they had ever seen an elephant in real life. One student raised their hand, but it turned out they only had seen a taxidermied elephant at a museum in Nairobi. Ethell says this lack of encounters is in part because most elephants are isolated in national parks, but also because the animals' population has dwindled. "People here (in the United States) see elephants 10 times more than Kenyans do and I think there is something wrong with that," Ethell says. She enjoyed engaging with the enthusiastic Kenyans, but eventually came to believe the students had more pressing issues than a lack of knowledge about elephants. Realizing the plight of many students, some of whom couldn't attend school because they didn't have a uniform and so scribbled notes in the dirt outside of the classroom, she returned to the United States to see if any organizations could help. "How well can any child, I don't care if they're here or in Kenya, learn about any subject if they have to sit on a muddy, wet floor," Ethell says. Ethell previously had delivered a talk at the Rotary Club of Wilsonville and so reached out to the club again to tell them about the needed desks. Wilsonville's Rotary focuses mostly on local projects, but had a surplus of $5,000 from previous international projects that fell through. So the club decided to donate the surplus to the Kakamega schools. "In order to educate the children and the future grown-ups, they needed infrastructure for the schools," Rotary member Jake McMichael says. "I thought it was a worthy project." Wilsonville's Rotary Club works directly with the Kakamega Rotary, which oversees the project, and McMichael suspects that the Wilsonville organization could do more for the Kakamega area in the future. "Now that we have contacts in the Kakamega Rotary Club through this smaller project, they will tell us what their needs are. And there are multiple needs for the children primarily, such as an orphanage, building up the schools, creating better classrooms, providing school uniforms and supplies," he says. With the arrival of the desks, the students will be able to sit down rather than stand or sit in the mud and jot down notes on a new chalkboard. And Ethell will attend a celebration presenting the new classroom tools later this month. Along with starting an educational YouTube channel and publishing her first book titled "The Will of Heaven," which comes out in June, Ethell says she will continue to teach students in America and Kenya about elephants until the day she dies. If all goes according to plan, her words will lead to collective action. "I really want to inspire kids here, kids there, I don't really care where they are," she says. "We just want to give them the best education and resources to make the best choices they can, whatever that is."